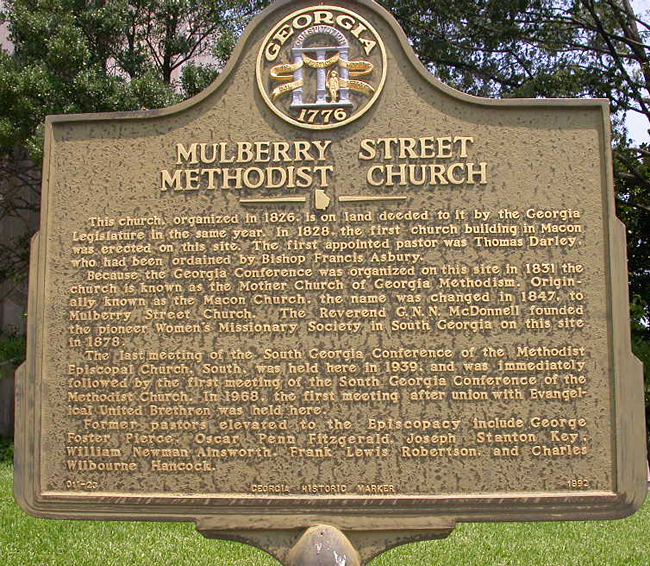 Mulberry Street Methodist Church, located in Macon, Georgia, is recognized as the Mother Church of Georgia Methodism. First started in 1826 by carpenter/preacher, Thomas Gardner, when Macon had only 800 inhabitants. The State of Georgia deeded the land for the church. Methodism had its roots in England with John Wesley and his brother Charles Wesley. It spread to the new America with the English settlers. Thomas Darley was born and raised in England during the time that the Wesleys were drawing huge crowds and converts to their new religion. Later, Methodism which was centered in South Carolina and Savannah began reaching into the new Georgia territories. Thomas Darley became a traveling Methodist minister after the end of the American Revolution. Born into a privileged, but not royal, class in England, Darley was a young Captain on one of the family's sailing freighters that traveled between England and America. The church first started in 1826, Rev. Darley appointment as Pastor in 1827, and the first church building in Macon was built in 1828 at this site. In 1831, the Georgia Conference was organized here and thus its name, The Mother Church of Georgia Methodism. Thomas Gardner, Carpenter and part-time Preacher, was the first Pastor of the Mulberry Street Methodist Church in 1826. Rev. 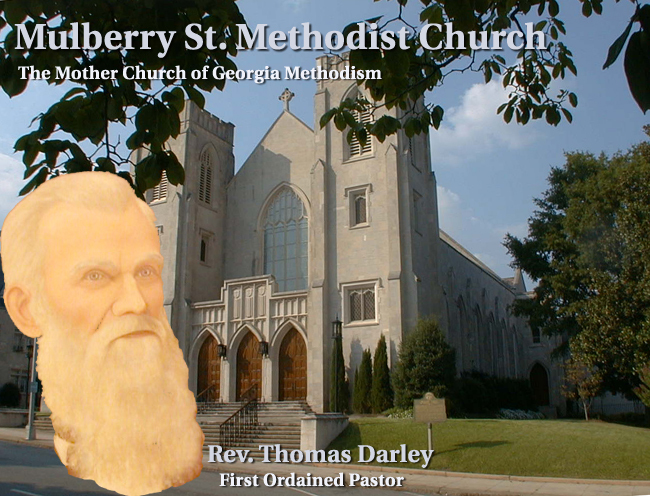 Thomas Darley, ordained by the famed American Methodist Bishop Francis Asbury, was sent to the Mulberry Church by the South Carolina Episcopal Methodist Conference in 1827. The calligraphy work, at left, was created by resident artist / church member, Elizabeth Waldrep. 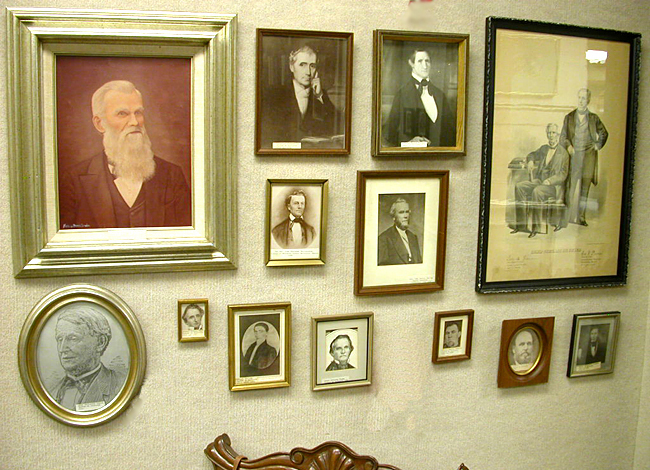 The Historical Room at the church has portraits and photographs of all the pastors. Thomas Darley is first on the wall. As a sea captain, the young Thomas Darley attempted running the British blockade off the coast of South Carolina during the American Revolution. He was captured and made a POW but, once identified, was forced into service by the British. He fought in one battle where he nearly lost his life. He used the Mason sign of distress which was recognized by an American Patriot and his life spared. He became a traveling Methodist minister after the Revolution and devoted the rest of his life to spreading the word of Methodism throughout the young South Carolina and Georgia. He rode horseback throughout the Low Country of South Carolina preaching and helping start numerous churches and later formed a circuit where he would preach. When Methodism needed a preacher in Georgia, Rev. Thomas Darley was at the lead. The curator of the Historical Room is Mrs. Carolyn Kennedy. As you walk into the Historical Room, there is a special display that is in the center of the room and faces you as you walk in. 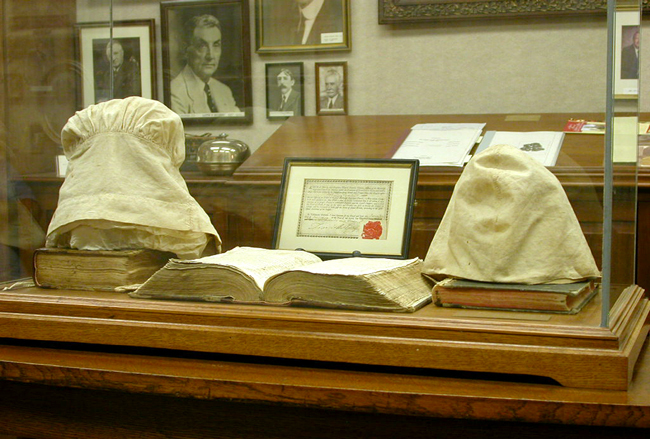 This display contains the Family Bible of Thomas Darley, his hymnal, his certificate signed by Bishop Francis Asbury and two night caps that were left by Bishop Asbury when he was visiting his friend and associate, Thomas Darley. 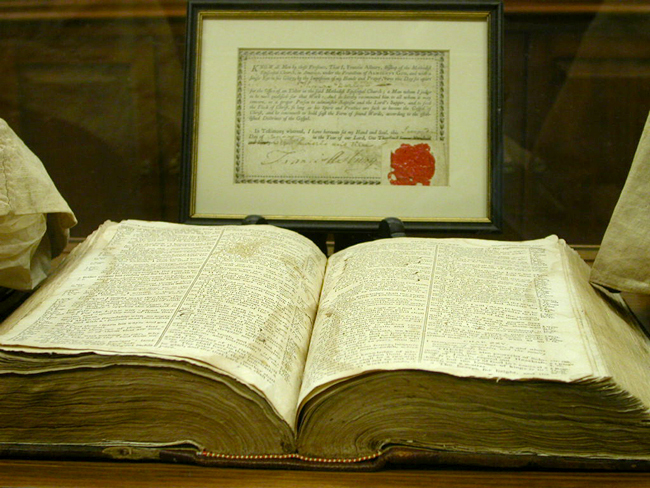 One thing I wanted to do was hold the Bible that my ggg-grandfather had held over 200 years ago. Touching something like this that you know that someone in your family has touched is special and rare. I did not get to do that on this trip, but maybe sometime in the future. One thing I wanted to do was see if births and deaths had been recorded in the back of this Bible. I saw copies made of the pages and yes, they were recorded there in Thomas Darley's handwriting. Rev. Darley had 22 children with two wives! My gg-grandfather, John Wesley Darley, Sr. was one of these 22 children and was born with Darley's first wife, Sarah Snelling. I have thought it special to have been descended through the namesake of the founder of Methodism, John Wesley. My ggg-grandfather was named John Wesley Darley, Sr. and my gg-grandfather was named John Wesley Darley, Jr..
Rev. 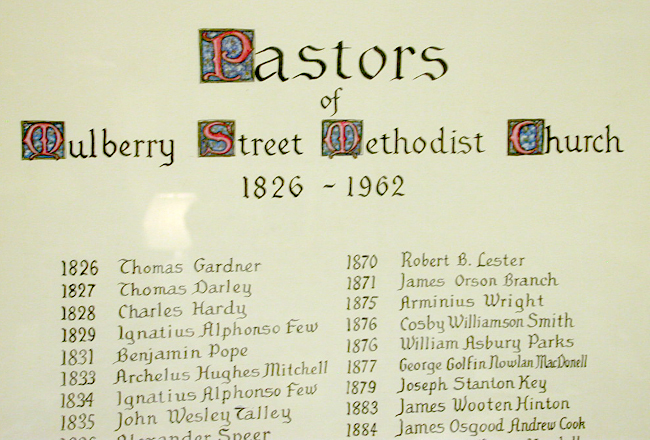 Thomas Darley, the first ordained pastor at Mulberry Street Methodist Church in Macon, Georgia, had 22 children and I am a descendant of these 22 children he named after John Wesley, the founder of Methodism. Several booklets in typewritten format contain descendency charts and I found my g-grandfather, my grandmother and grandfather, my father and mother, and all my aunts and uncles. Normally, history seems so far off and removed by time, but now real connections to the historic past were right in front of me. 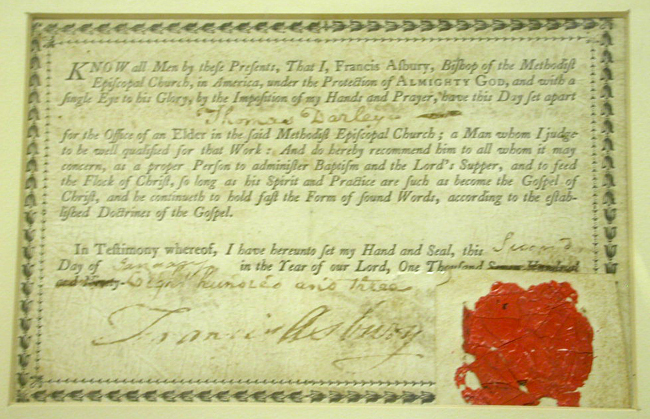 This is Thomas Darley's papers designating him as an ordained pastor and signed by Francis Asbury. The historical marker that is in front of the church. Thomas Darley was connected with a great deal of history in the young states of Georgia and South Carolina. The Darley family has been connected to history for almost 1,000 years. The family history starts in Normandy where Arabian horses are being raised and then later used by William the Conqueror, the shipbuilding wing of the family built the Mayflower, and the Darley Arabian was the first thorougbred horse in America and nearly all American thoroughbreds are descended from him. I also have a theory that the Darleys (and Methodists) were also strongly involved with the western expansion over the Rockies in the early to mid-1800's. There is a connection between John Wesley Darley with the Ashleys. He married the granddaughter of William Ashley. But, there are two William Ashleys, one a veteran of the American Revolution, and the other a General in the Missouri regiments that fought in the War of 1812. Gen. William Ashley went through South Pass and established a route that later became the California, Oregon and Morman Trails that opened the door to the West. Are these two William Ashleys, one from Maryland and one from about 100 miles away in Virginia, possibly cousins?